Print this information in PDF. Check out the Coalition to Unchain Dogs for fencing building videos and more information. You can purchase all materials at farm supply stores such as Tractor Supply Company or home improvement stores such as Home Depot. Try asking for donations to buy supplies or pay a fence company. Take pics of the needy dog and post to social media or a crowdfunding site such as gofundme.com. Your friends may be very willing to pitch in time, money, or supplies! Posts. Choose metal T-posts or wooden posts. You can get wooden posts cut to specifications. Place posts 6-8 feet apart. Baling wire or wire ties to attach the mesh to the posts. 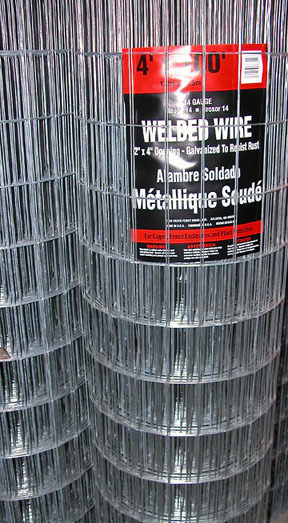 Baling wire comes in a roll and can be cut into pieces. A heavy duty staple gun can be used to attach mesh fencing to wooden posts. Shovel or post hole digger if setting posts in concrete. Watch my short video to see the below steps in action. Lay posts next to your lines, where you plan to stand them up. The closer you place the posts to each other, the stronger the fence will be. 6-8 feet apart is good. 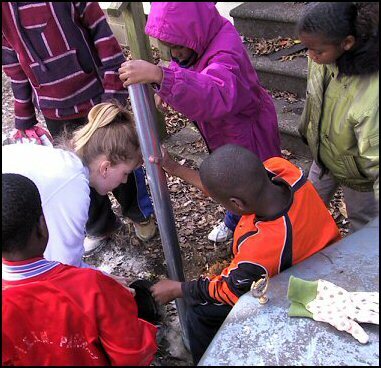 Pound metal T-posts into the ground with a sledgehammer or post driver. the post, and at the bottom of the post. Stretch the fencing as tightly as possible against the posts. One person should pull the mesh very tightly to the edge of the post while someone else attaches the mesh to the post. Be sure the mesh is all the way to the ground. 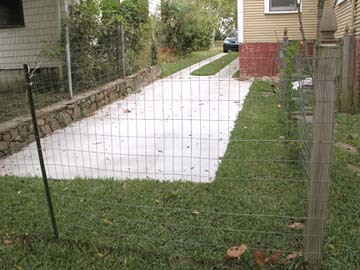 If the dog digs, you may need to bury a few inches of fencing. 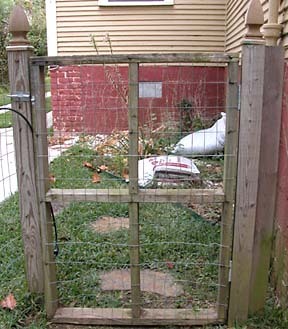 A gate will work best if attached to a post set in concrete. You can buy a gate or make one from wood and mesh fencing. This gate was made with a wooden frame. Mesh fencing was stapled to the frame. The wooden gate is attached to the wood post with a door hinge. 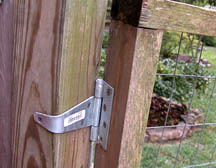 A slide lock was also added to help keep the fence shut. A bike lock can also be used. between corner posts. This fence has kept many 50-70 pound dogs inside. 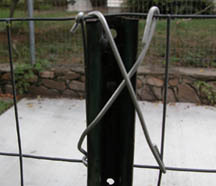 Two wire ties are used to attach the mesh to the top of the T-post. One 40 lb. bag of concrete mix is enough for 2 posts. You can use quick-set. Dig a hole. The post needs to be at least 1 1/2 or two feet underground. Put a few rocks in the bottom of the hole, then set the post in the hole. It’s easiest if you have someone to hold the post in the center of the hole. Pour about one-third of the concrete mix into the hole. Pour it around the post. Pour about half a gallon of water into the hole and stir the concrete around with the stick. Keep adding concrete mix and stirring in water in until the hole is filled with the concrete mix. Refer to the directions on the package. Cover the concrete with the dirt from the hole. Pile dirt or rocks around the bottom of the post to keep it in place while the concrete sets. In 24 hours, you post should be set with regular concrete. With quick-set, your post will be ready in an hour.